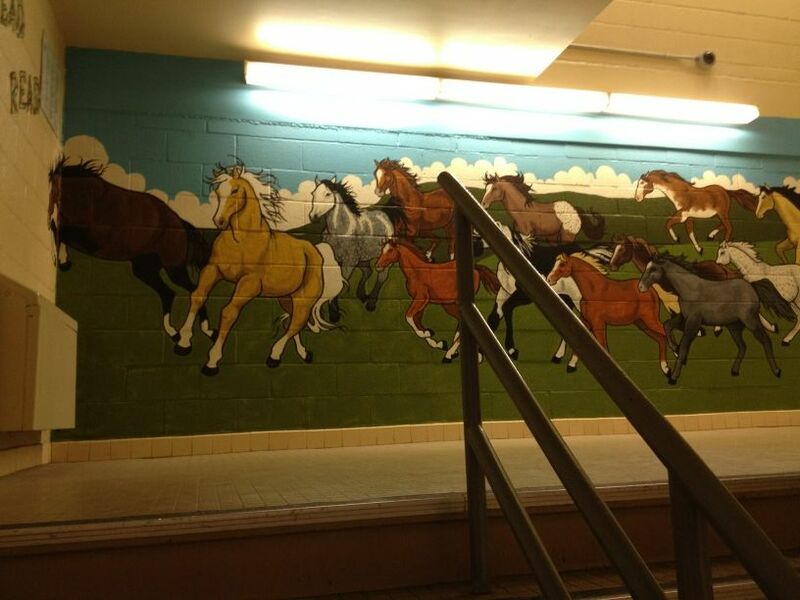 A parent-artist painted this mural in my neighborhood public school. What have you done for your public school lately? These are the concluding lines of Dana Goldstein’s inspection of the progressive credentials of politically liberal homeschoolers in Slate (Liberals, Don’t Homeschool Your Kids, February 16, 2012). While there’s a lot to argue about in that piece, right now I’m content to praise it for promoting public schooling as a political virtue. Which it is. Happy reading! And if you live in Baltimore, register to volunteer in a Baltimore City Public School today! In Why Urban, Educated Parents Are Turning to DIY Education (Newsweek/Daily Beast, January 30, 2012), education writer Linda Perlstein interviews homeschooling moms – only moms – who answer the “why” of the article’s title in highly personal ways. None talks about finances. Linda (I know Linda, or I’d call her Perlstein) mentions that some homeschooling parents work full-time or take on part-time gigs. But I have a hunch you’ve got to have a pretty conventional family dynamic – married, with male parent winning the bread – to pull this off. Maybe I’m wrong. But someone needs to pay for health insurance, cover the mortgage and clothes and food, maybe make a car payment and put some money away for college. Did you catch mom Soni Sangha’s The Pre-K Underground (New York Times, December 16, 2011) on illegal parent co-ops in New York City? This is what it looks like when middle class parents are forced to get creative because the public schools can’t offer them what they need and private school tuition is impossibly out of reach. I would also lump into this category of “trend” community-supported education. In “Can a Community Support Education?” (Cooperative Catalyst, January 29, 2012), Donna Mikkelsen introduces a private, community-based school called The Garden Road School, which she founded. The school’s story sounds very much like that of a private school in Baltimore called The Greenmount School, and I’m sure there are others like it in cities across the country. These schools are started by parents and represent an affordable independent school option for parents who want an alternative to both the high-anxiety world of upper-crust prep schools – with the endless homework and drive to perform – and the welfare-state interventions of soul-crushing testing dished up by the public schools. Jacqueline Edelberg and Susan Kurland’s How to Walk to School: A Blueprint for a Neighborhood School Renaissance (Rowman and Littlefield Education, 2009) is an account of the transformation of a public school in Chicago called Nettlehorst. The book includes a foreword by Arne Duncan and a short essay by Rahm Emanuel. It’s a story of what can happen when the grit of mostly not-full-time-employed urban gentry moms meets the unstoppable force of a principal extremely open to change. I credit Edelberg’s book talk of January 19, 2011 at the Enoch Pratt Library with reigniting my passion for working with my neighborhood public school. A number of parent groups in Baltimore are hopping on this train. I think it’s fantastic and – like all the other tactics listed here – fraught with complexity. Freelance writer Amy Landsman interviewed me and several other parents for “School Choice: Options for City Parents” (Baltimore’s Child, October 2011) at the request of the editors there, one of whom is my neighbor. The article also features Judy Chung O’Brien, president of the Downtown Baltimore Family Alliance and a mom at a traditional public school called Federal Hill Prep. Parents are organizing themselves around schools in Charles Village, Hampden, Bolton Hill. Speaking for myself, if I didn’t feel some serious financial pressure to make my neighborhood public school work for my family this blog wouldn’t exist and I wouldn’t have founded a parent group. It’s more complicated than that, sure. But why not admit money is a driver? A savvy District could do great things for schools now that the housing market downturn will force middle class families with young children to stay in Baltimore City. It’s impossible to talk about charter schools in Baltimore without talking about Bobbi Macdonald and City Neighbors. (In fact, the day after I wrote this sentence, yet another post came out singing its praises.) City Neighbors Public Charter School, which now has two campuses and a high school, has become a shining utopia in what is otherwise painted as an apocalyptic public school landscape. It’s worth remembering that what spawned its founding wasn’t just love but money, or lack of it. The City Paper piece reported by Anna Ditkoff (Late Start, Baltimore City Paper, May 12, 2004) starts where the school did, with Macdonald’s wish to find a great school for her eldest daughter. When she couldn’t find one that she loved – and could afford – she started her own, with public funds and pro bono legal services from DLA Piper. These “trends” – or maybe it would be better to call them “tactics” – are each a kind of reaction to anxiety among parents who aren’t poor enough to benefit from social services nor rich enough to sniff at the cost of child care and excellent schools. We are the monkeys in the middle. We are often outsiders, new to the communities in which we live, wary of membership in the traditional institutions that used to offer middle class families support. For those of us doing well, affordable childcare and free public schooling add immeasurably to our quality of life. For those not doing as well as our parents did, the anxiety of our kids’ slipping further downward in the class ranks is too much to bear. So we are taking up arms – some alone, some together. We are not going down without a fight. If I didn’t have a full-time job – a job I truly love, but also very much need – I would write a book.